Maxine is just as at ease around people as she is around other cats. Born in 2013, she came to Best Friends from Louisiana due to her mobility issues. Maxine was declawed in the front. The surgery did not go well and resulted in lameness. It doesn't help that Maxine is overweight, so she is on a diet. She's also under doctor's orders to go on walks with a harness and leash for exercise, but she takes a lot of stops to sun herself. She's on medication to manage her pain. 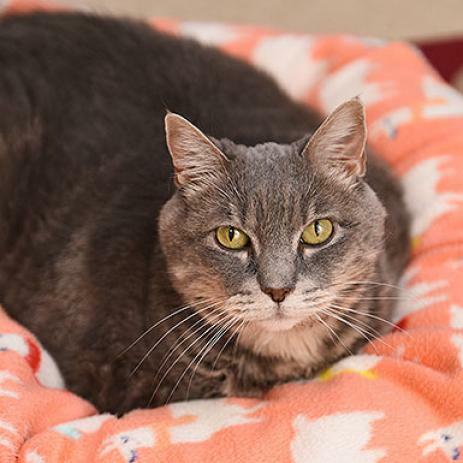 Despite her issues, Maxine remains super sweet and loving to everyone around her. She'll gladly sit on your lap if you help her up, and if you call her name she'll answer and talk to you. This delightful girl dreams of having a home with people she can love.